Includes airfare, car rental, trains, hotel accommodations, tours and more. Italy — the enchanting country — has it all! November is dedicated to the typical flavours of autumn in Tuscany: bottling of the new wine begins, usually referred to as vin novello, the olive harvest has begun with pressing of new olive oil, chestnuts and mushroom hunting are in full force. Today you embark on your journey to Italy! It will be full of unforgettable sights, smells and some of the most delicious foods you'll ever experience! When you arrive in Rome you will be welcomed to Italy by our driver. They will take you to your hotel, central to all the historic sites in Rome. Spend this day settling in and exploring "The Eternal City" on your own. Today, you'll go deep into the unusual history of Rome, far below its busy streets and towering monuments to the concealed side of this ancient city. The itinerary includes three unforgettable stops with one thing in common – they are some of the most uncommon, mysterious and outlandish sites the Eternal City has to offer. The tour begins with a trip to the ancient Roman catacombs. Dating back almost 2,000 years to the 2nd century AD, this extensive network of tunnels snaking underground was once both a burial ground and a place of worship for the first Christians in Rome. With an expert, English-speaking guide on hand, you’ll explore these extensive tunnels lined with tombs carved right out of the rock, and hear the fascinating history of these sacred places. From here you will be taken near the Colosseum to the Basilica of San Clemente, easily the best example of exactly how deep you need to go to understand Rome's unbroken history. It was discovered that the structure we see today sits on top of two millennia of foundations, including 12th and 4th century basilicas, a 2nd century cult temple, and ruins dating back to Nero's Great Fire in 64 AD, with a functioning aqueduct in which water still flows today. Like the catacombs, you will see it all with in-depth commentary from your guide. The tour ends with the Capuchin Crypt – known locally as the ‘Bone Chapel’. Here Capuchin monks used the bones of nearly 4,000 of their brothers to decorate the walls and ceilings in intricate designs. See a real skull and crossbones, vertebrae chandeliers and full skeletons in their robes before drawing your own conclusions on the meaning of this macabre, yet intriguing place of prayer. The museum annex is also home to Caravaggio's 'St. Francis in Meditation'. Venture into restricted areas of the Colosseum Underground where slaves, gladiators and wild animals were held before fighting to the death on the Arena floor that loomed above them. You'll retrace the last steps of a gladiator in another restricted area as you walk out onto the Arena Floor. After the Colosseum, you'll visit Palatine Hill and the Roman Forum. 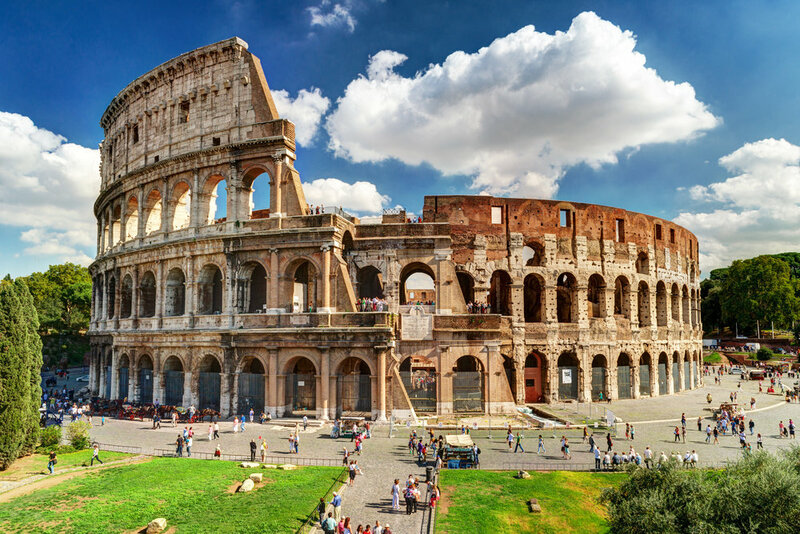 These two Roman archeological sites are home to amazing sites such as the Temple of Julius Caesar, the Arch of Titus, the Roman Senate House and much more. Your expert guide will rebuild these structures in your imagination through history and legends from the ancient world and with the help of a visual display book that will show you what the ruins looked like in all their glory. This morning, you'll check out of your Roman hotel and board a train for Tuscany! 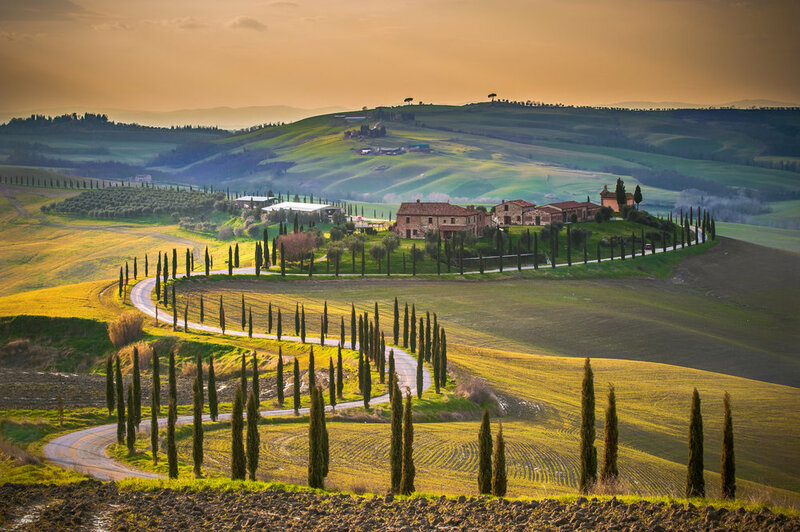 When you arrive in Florence you will rent your car and drive to your hotel in the Tuscan countryside. 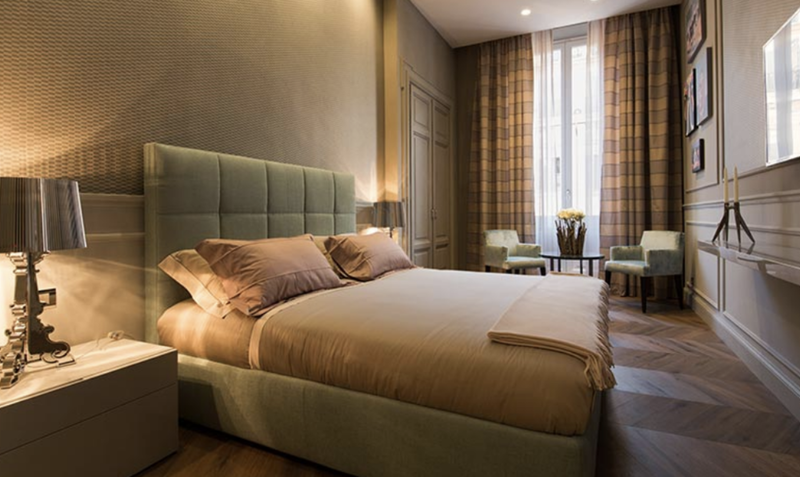 Spend the rest of the rest of your day relaxing and settling into your room and the Tuscan scenery. Begin your day with a visit to San Gimignano, a small walled village about halfway between Florence and Siena. 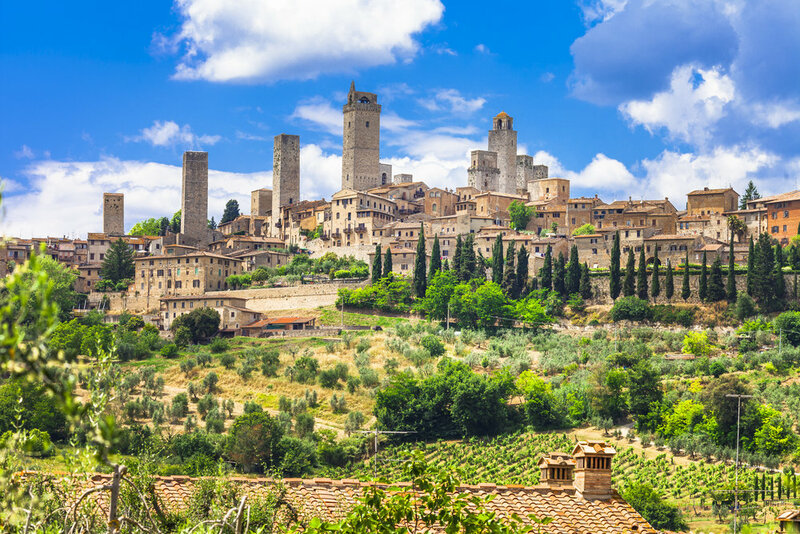 Recognized as a UNESCO World Heritage Site since 1990, San Gimignano offers visitors the chance to step back in time while enjoying its local products including saffron and its white wine, the Vernaccia di San Gimignano. Continue on to the family-owned vineyard estate and winery of Castello Banfi, in Brunello di Montalcino. Though it’s famous for its award-winning Brunellos, syrahs, merlots, cabernets, and blends, you’ll want to stay long after the wine tasting to soak in the spectacular surrounds (the estate boasts 7,000 acres of vineyards, olive groves, and cypress trees). End your day with dinner in Siena. Likely Italy's loveliest medieval city, and a trip worth making, it's been the backdrop in several movies and boasts some of the most beautiful views in Tuscany! Undoubtably, Chianti classico and the neighboring area of Chianti, just south of Florence, is one of the best known valleys and wine producing areas. Offering a wide selection of labels, production styles and recipes that exalt the Sangiovese grape which date all the way back to 1716 and beyond. While you’re in the Chianti region, spend some time at the small, family-run winery in the medieval village of Montefioralle, near Greve. Azienda Agricola Montefioralle produces only 10,000 bottles of wine a year (it’s one of the smallest wineries among the Chianti classico producers) but that’s where its charm lies. A member of the Sieni family, who own the winery, will personally take you on a tour through the vineyards and cellars, followed by a tasting of all six wines produced. If you haven't spent all day eating, drinking and conversing with the Sieni family, head south to the Avignonesi winery. The stunning Avignonesi winery, located in the village of Valiano near Montepulciano, produces eight red wines (including an award-winning merlot), a chardonnay, and three grappas. The winery boasts one of Italy’s most ancient and beautiful wine cellars, allegedly built in the late 16th century. We recommend the general tour, which takes you through the vineyards, cellar and attic, followed by an excellent four-course meal with wine pairings. IF you have any time left for the day, stop by Cortona on the way home and take in the history. Various small shops on the main streets of Cortona offer local handmade items and gastronomical products. There are many restaurants in the city, most offering traditional local and Tuscan cuisine. This morning you will check out of your Tuscan hotel, return the rental car in Florence and board your train to Venice. When you arrive, hire a water taxi to take you to your central Venice Hotel! Spend the day exploring the City of Mirrors, Theatre and Glass. 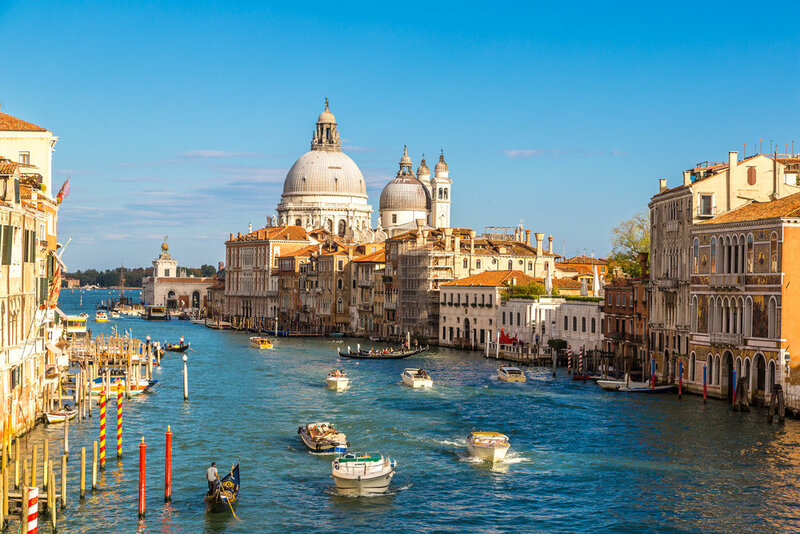 With its 150 canals, 400 bridges and magnificent 16th- and 17th-century palaces and piazzas, it is no surprise that Venice is considered one of the most beautiful cities in the world. There are many sites to see around Venice. 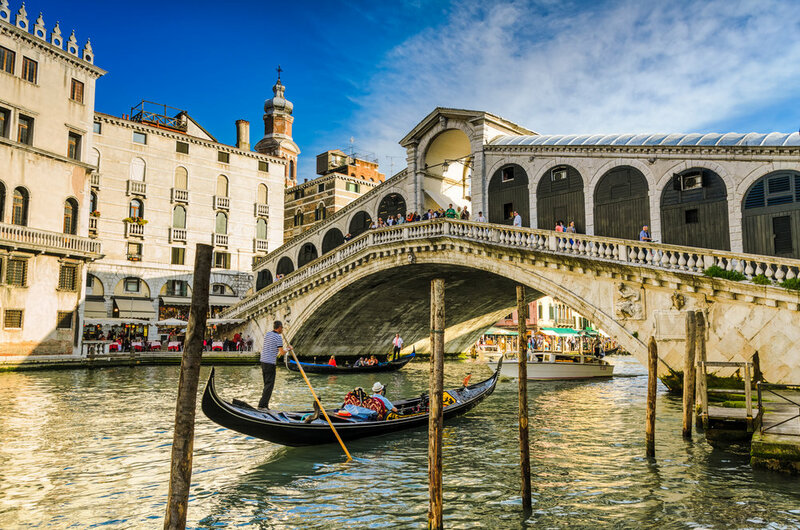 You may want to consider strolling through the Piazza San Marco, or taking a gondola ride under the Rialto Bridge! Be sure not to miss St. Mark's Basilica and Campanile or Doge's Palace! This afternoon, enjoy a private 2-hour mask painting workshop under the guidance of a resident artist. You’ll choose two masks each from more than 50 different styles and decorate it according to different techniques. While you work, your guide tells stories of traditional masks and their function in society. The story of Venetian Masks is totally unique, they began life at the fringes of the Carnival but then proceeded to become a major part of everyday life for the residents who would wear them for more than 6 months a year! The ‘Bautta’ was even used in front of the Doge and at other important events in the political and social life of Venetians! As well as the ‘Bautta’, there is another influential symbol of the city, they call it the ‘Moretta’. It has a totally different meaning, it is much more playful and was used as a charming instrument of seduction. This introduction is enough to give you an idea of the strange, diverse and wonderful world that Venice once was. Furthermore, members of the Ca’ Macana team dress up in the Bauta, Volto and Tricorno and explain their traits in depth. Additionally, you will see a real example of a Moretta whilst explaining its original use and the context behind it. There is a Venician opera playing at Teatro Malibran! The original work of this opera is based on the incident about the assassination of King Gustav III of Sweden at the masked ball. Giuseppe Verdi was requested to compose this opera by Teatro di San Carlo in Naples, Italy. But, this opera which is based on the assassination of the King couldn’t pass censorship. So, Verdi changed the setting from Sweden to America. In addition, the world premiere of this opera was held in Rome because this had softer censorship than Naples at that time. People in Rome enthusiastically welcomed this outstanding opera. In the 18th century, a masked ball was becoming popular among the aristocracy. People concealed the identity by a mask at that time, so the ball often became the stage of an assassination. This opera has well-balanced characters, for example, the governor Riccardo and his lover, Amelia. In addition, Riccardo’s friend and secretary, Renato, add attraction to this opera. Ulrica who is a fortune-teller and leads the ending of this opera is also one of the most important characters. It would be easy for Verdi to compose this opera based on the script that had enough balanced characters. In act 3, after the love between Riccardo and Amelia is found out, there are three great arias. First, Amelia sings her aria as a mother. Second, her husband, Renato, sings his aria about a vow to take revenge and his lost love. Third, Riccardo sings his aria about giving up his love and his misfortunate future. These three arias express direct feelings of three respective roles. Today you will bid arrivederci to Italy. You'll travel to the Venice airport and board your flight home. Final payment will be due immediately. Insurance costs are based on the total tour cost, including air taxes and charges listed under "Not Included." These charges are added to the final billing. *Cancel for Any Reason coverage is available and would refund passengers 80% of their trip cost. Cancel for Any Reason insurance must be purchased at or before Final Payment. To ensure the price of $TBD, the deadline to sign up is by the final payment deadline of TBD. This means that if you sign up on this day, you also need to make full payment on that day. If you miss this deadline and would still like to join us, you can still sign up; however, the price may increase and accommodations may change. Can I carry my bag into the Colosseum, Roman Forum or Palatine Hill? To avoid disruptions or possible denied entry, we strongly suggest that you avoid bringing large purses, bags or backpacks on your tours. The Colosseum, Roman Forum and Palatine Hill do not allow large purses, bags or backpacks to be brought onsite. Visas are required for all U.S. and Canadian citizens traveling to many areas around the world including Asia, Australia, South America, India and Brazil. For the appropriate requirements based on your itinerary and nationality please contact your local immigration office. Zone Travel LLC requires payment of a fixed service fee for all guests. The charge is per person and non-refundable; however, there is no charge for children under the age of three. It is our earnest wish that you enjoy your vacation experience and we will provide you with the standard of service for which Zone Travel LLC is known. Therefore, if you have any concerns about the service you receive during your vacation; please bring them to our immediate attention so that we can address any issues in a timely manner before your travels are over. In almost all cases we are able to come up with a satisfactory solution to any issues which are raised and make sure our guests can focus on enjoying their vacation. Our clear priority is to have the opportunity of resolving the issue, when it happens, to everyone’s complete satisfaction.